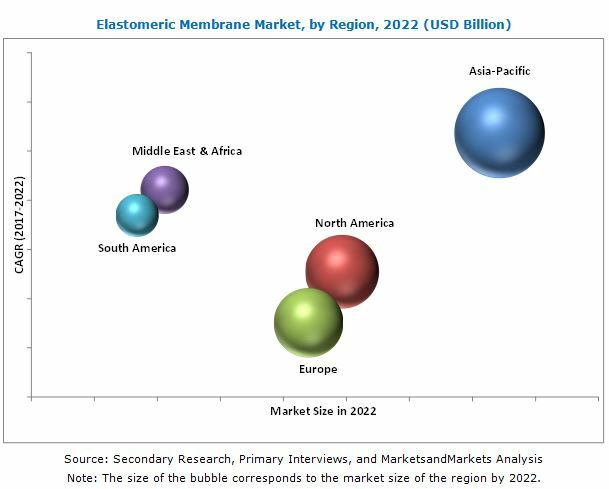 [142 Pages Report] Elastomeric Membrane Market size was valued at USD 27.82 Billion in 2016 and is projected to reach USD 41.10 Billion by 2022, at a CAGR of 6.7% during the forecast period. High demand for the elastomeric membrane in the construction industry, and regulations related to energy optimization are driving the elastomeric membrane market across the globe. This study estimates the size of the elastomeric membrane market for 2017 and projects its growth by 2022. It provides a detailed qualitative and quantitative analysis of the elastomeric membrane market. Secondary sources, such as Hoovers, Bloomberg Business Week, and Factiva, among others have been used to identify and collect information useful for this extensive, commercial study of the elastomeric membrane market. 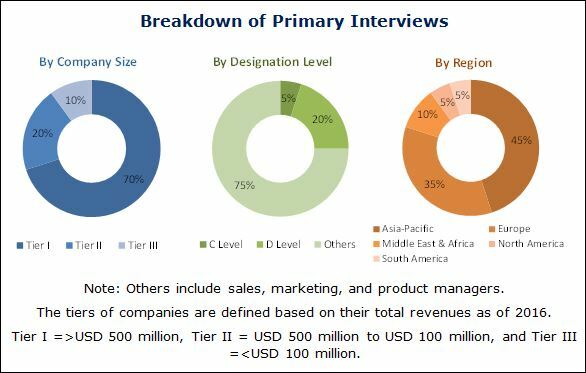 Primary sources such as experts from related industries and suppliers of elastomeric membrane have been interviewed to obtain and verify critical information and assess future prospects of the elastomeric membrane market. The key players profiled in the report include, BASF, Sika, Carlisle Companies Inc., SOPREMA, Kemper System, Saint-Gobain, Firestone Building Products Company, Johns Manville, GCP Applied Technologies Inc., and Standard Industries Inc. The elastomeric membrane market is projected to reach USD 41.10 Billion by 2022, at a CAGR of 6.7% from 2017 to 2022. The elastomeric membrane market is expected to be driven by increasing residential and non-residential construction projects that are resulting in the growth of the construction industry. Moreover, regulations for energy optimization are increasing in order to address environmental concerns. Since elastomeric membranes such as TPO and EPDM contribute to energy savings, these regulations are expected to drive the elastomeric membrane market. On the basis of type, the elastomeric membrane market has been segmented into sheet and liquid applied elastomeric membrane. The market for sheet membrane type of elastomeric membrane is the largest due to its superior performance and increasing demand for flat roofs in non-residential buildings. Sheet membranes such as TPO and EPDM are widely used in the enhancement of energy efficiency of buildings. High demand for green roofing in green buildings is expected to trigger the use of sheet membranes. The liquid applied membrane is the fastest-growing type owing to its seamless installation, convenience associated with its use, and availability of less expensive grade products as compared to sheet membranes. On the basis of application, the elastomeric membrane market has been segmented into roofs & walls, underground construction, wet areas, and other applications. Roofs & walls is the largest as well as the fastest-growing application in the elastomeric membrane market. High expenditure on non-residential projects involving, commercial, institutional, and office buildings is expected to drive the growth of elastomeric membrane market in flat roofs. On the basis of end-use industry, the elastomeric membrane market has been classified into residential construction and non-residential construction. The non-residential construction segment is both, the largest and the fastest-growing. Growing foreign investments in the construction industry, high-end commercial projects, and industrial development are expected to drive this segment. Growing construction of commercial buildings such as shopping malls, multiplexes, show rooms, institutional buildings, offices, and industrial buildings are resulting in the growth of the market. Industrial construction projects are also increasing due to growing manufacturing activity and growth in retail construction to meet consumer needs. These factors are cumulatively expected to result in high growth of the elastomeric membrane market in this sector. Based on region, the elastomeric membrane market has been segmented into Asia-Pacific, North America, Europe, the Middle East & Africa, and South America. The Asia-Pacific elastomeric membrane market is the largest and fastest-growing market due to substantial investments in residential and non-residential construction projects to meet the housing and infrastructural needs of the growing population. Cheap labor, cheap & accessible raw materials, and public infrastructure projects have boosted construction activities, thereby, increasing the demand for elastomeric membrane in this region. The key restraining factor in the elastomeric membrane market is the fluctuating price of raw materials. Moreover, companies such as BASF, Sika Carlisle Companies Inc., SOPREMA, Kemper System, Saint-Gobain, Firestone Building Products Company, Johns Manville, GCP Applied Technologies Inc. and Standard Industries Inc. are active in the market and are providing innovative products to the construction industry. Moreover these companies are engaged in mergers & acquisitions and investments & expansions strategies to enhance their foothold in the market. 12.7 GCP Applied Technologies Inc.
12.11.12 W. R. Meadows, Inc.